birds : I had another chance to go look at the mystery Aythya at lunchtime, which has since been joined by a second bird. I suspect that there have been two birds all along, and on Tuesday I briefly saw a second duck on the main lake which I didn't have chance to look at. No-one has sent me any more photos of the birds so I was keen to get snaps of the second bird and hoped for any wing pattern to show. When I arrived, both birds were together on the small pond showing well. 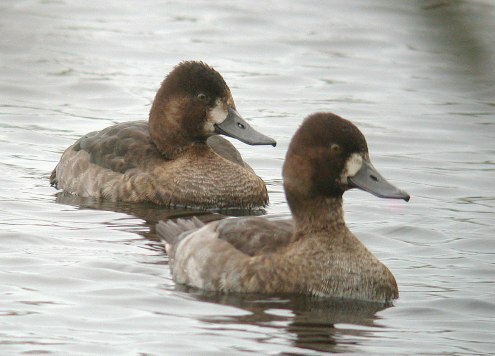 As can be seen from the above photo, the second bird removed any doubts of Tufted Duck as it had grey feathers appearing on the mantle indicating a first-winter male scaup sp. 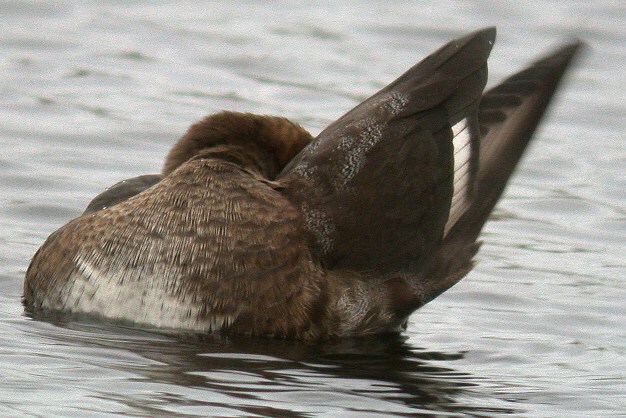 The vermiculations on these feathers, and the ones on the flanks seemed quite strong - Lesser Scaup is more strongly marked than Greater on the grey areas. Just as I set up the scope, this bird stretched its wing out briefly and I had a quick glimpse of the wing-bar. 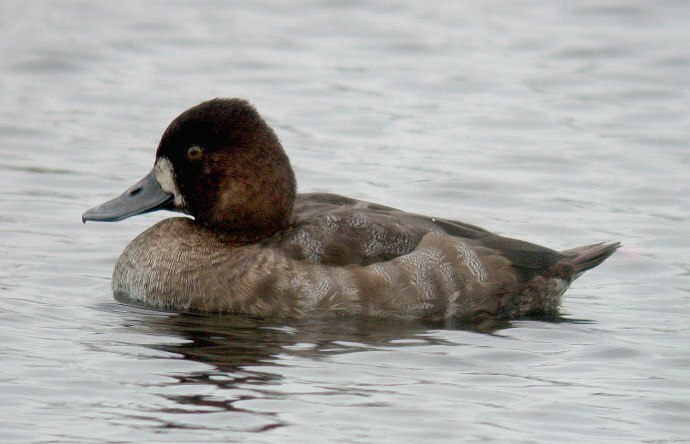 I know it is difficult to tell on one short view but it did strike me as being Lesser Scaup-like, with the secondaries being bright white, but the primaries being dusky with no white (see the photos below I found in the internet). 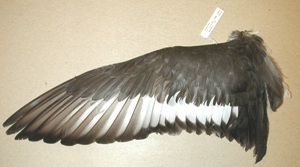 Of course, I needed to see the wing a few times to be convinced, but it didn't stretch it out again whilst I was there. It did sort of half stretch when I had the camera out as you can see in the photo below. Even on this photo, only the first 6 or 7 secondaries seem clearly white and the outer couple of secondaries look dull and slightly greyish. 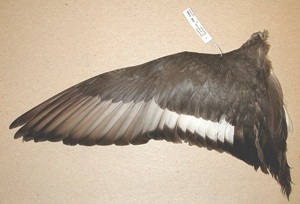 Structurally, this second bird was very similar to the first, but probably showed a more obvious peak on the rear crown. I would certainly say Lesser Scaup is at the moment the top of my list of possibilities, but unless I get a pic of the wing pattern, I have a feeling that it will be left as unidentified. Hopefully this weekend I can get a chance to get the money shot! nonsense : On Wednesday I went down to watch the France v Ireland world cup play-off match with a couple of my irish mates and we were literally incandescent with rage at the cheating French. 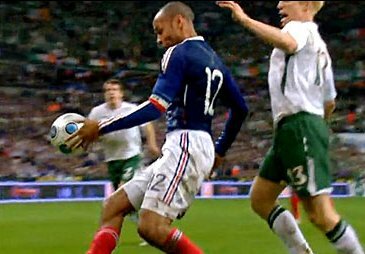 First of all there was the blatent cheating by Platini to suddenly decide that France should be seeded and then Henry's double-handball was bad news. I know there's nothing that can be done about it now but Henry should be banned from the first matches of the World Cup for deliberately cheating. It must be time for video replays - I am sure supporters would prefer accuracy rather than worry about short breaks in the play. And to make it worse there was a table of Frenchmen next to us who clearly don't understand winning with dignity. It's a good job this was Guernsey as elsewhere they would have been pulped - and they made a hasty exit anyway. And they wonder why the British are suspicious about closer ties with Europe - it's the French!